TAMMY is another famous Livingston & Evans title song. 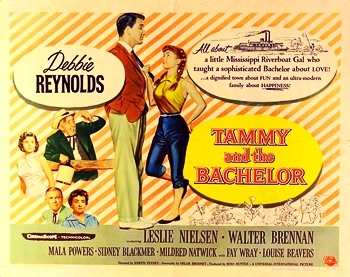 It was written for Debbie Reynolds to sing in the Universal picture, “Tammy and The Bachelor”. The Debbie Reynolds record was a huge hit, and the song received an Oscar nomination in 1957. When they didn’t win, the president of the Motion Picture Academy told them they didn’t receive the award because of a promotion Universal sent out to all Academy members: a letter written in a girl’s handwriting and signed, TAMMY, asking for votes. The Academy members apparently resented this blatant advertising, although today this sort of thing is rampant.